(L to R) Sue Sandberg, MBA, RN, Chief Executive Officer of MelroseWakefield Healthcare, and James Herrington, Chair of the Board of Trustees. Fiscal year 2018 marked our second year as a member of Wellforce and continued to bring the promise of our partnership into reality. 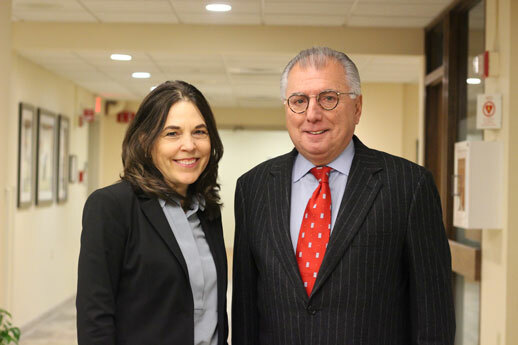 We focused our efforts on strengthening our collaborations with our peer members, Tufts Medical Center and Circle Health in Lowell, and on bringing greater access to specialty services to the communities we serve. Some examples of this exciting growth are described in this annual reflection. We established robotic surgery services that offer patients advanced, minimally invasive surgical options that allow for the least postoperative pain and the quickest recovery. We expanded our neurosurgery services that provide treatment for a full complement of conditions from back pain to brain tumors. We celebrated 25 years of advanced cardiac care in the community and many other milestones that are raising the bar in local community care. With healthcare needs steadily moving to lower-cost settings, we took the bold initiative of setting into motion plans for a state-of-the-art ambulatory surgery center in the community. We accomplished all this while being successful financial stewards in a challenging healthcare market and making significant financial improvements. To reflect and embrace our dynamic growth, we re-envisioned our brand and adopted a new name, MelroseWakefield Healthcare, and visual identity. Our new name reflects our ties to the greater north suburban Boston region that we serve, and our new, modern look demonstrates our growing clinical partnership with Tufts Medical Center. In addition, our employed physician group changed its name to Tufts Medical Center Community Care. Serving our patients remains the foundation that drives all our endeavors. MelroseWakefield Healthcare with its rich history is well positioned for the future. We are confident in our continued growth and enthusiastic about what lies ahead in 2019 and beyond. We are deeply honored to lead MelroseWakefield Healthcare at such an exciting time.